We returned to SGL 57 to explore some new streams and forests. The plan was to first explore an unnamed creek that flows in between Stony and Becker Brooks. We climbed up the steep and rugged glen of this creek which harbored countless cascades and about three falls 10-20 feet high. It was tough climbing up the boulder strewn bed of the creek as it was caked with ice and snow. Wes and Ryan climbed the rim of the gorge as I followed the creek. We reached the top and turned right onto a gated game commission road that explored a hardwood forest with some huge cherry trees. This soon brought us to the road that goes to the Dutch Mountain coal mine. There was a truck parked at the old mine, it appeared to be someone running hounds. We entered the mine where it was noticeably warmer; a spring flowed out of the depths. A climb to the ledge on top of the mine offered some views as we got a bite to eat. A nice campsite was hidden under some hemlocks. The trail took us across Red Brook, dotted with mounds of snow, draped under hemlocks and spruce. I had never followed this old trail across Red Brook; the trail wandered into a bare hardwood forest and crossed a few small streams before entering a spectacular spruce forest along Coalbed Swamp. The forests were deep and green, dusted with snow, it was a winter wonderland as the sun began to shine through the breaking clouds. Not happy with just seeing the forest, we decided to reach the swamp. The swamp was more open than others we’ve explored; it had few blueberry thickets. Frozen mats of sphagnum moss covered the sodden ground underneath. Despite its name, Coalbed Swamp is pristine and is one of the most diverse places in the state, being the home to several rare species. Hiking into the frozen swamp soon lost its excitement and we re-entered the incredible spruce forests. The diversity of SGL 57 never ceases to amaze. The hounds barked on the far side of the swamp. After retracing our steps, we turned on another trail that took us to the outlet of Coalbed Swamp, and the source of Red Brook. The name of brook soon became obvious; the water was a deep amber color thanks to the decaying vegetation in the swamp. The remainder of our journey was to follow Red Brook. We battled through spruce to be treated to a hidden cascade in a grotto of conglomerate boulders and ledges. We crossed the trail we hiked previously and continued down the brook. Red Brook is one of the most scenic streams in SGL 57, featuring many cascades and small falls, old growth beech and hemlock, and deep gorges. The first highlight was a dramatic falls in an incredible grotto framed with ice flows (in the picture above). An old railroad grade soon came into view. The grade was rocky and still had ties in it, but it was easier hiking than bushwhacking along the brook. 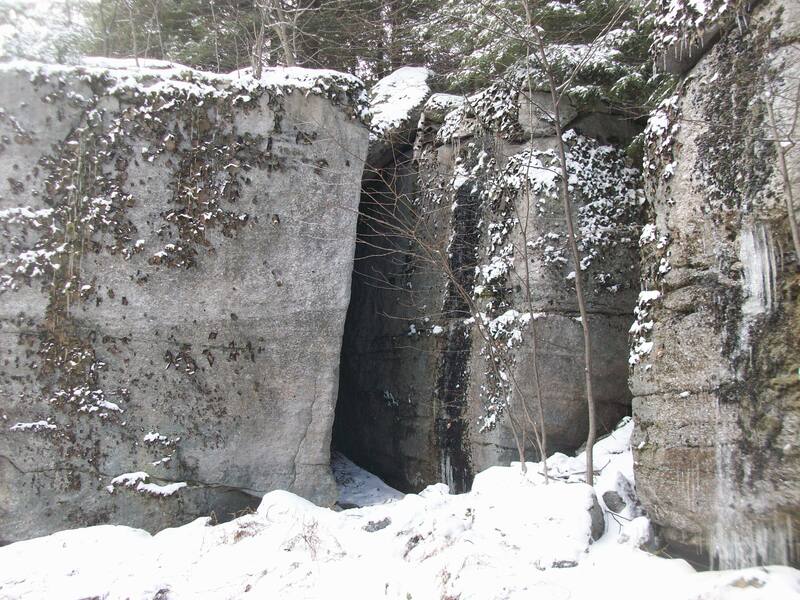 The grade passed cliffs with frozen springs and huge boulders along a steep slope. The top of the second falls soon came into view. We scrambled down to the falls and it was an impressive sight, the main drop was about 30 feet as the water roared down. Smaller falls were both above an below the main drop. We couldn’t reach the bottom due to the ice. After getting more to eat, we continued down the old grade. Our hike continued along another old grade above flood torn Stony Brook back to the car as the sunlight faded on the tops of the mountains. 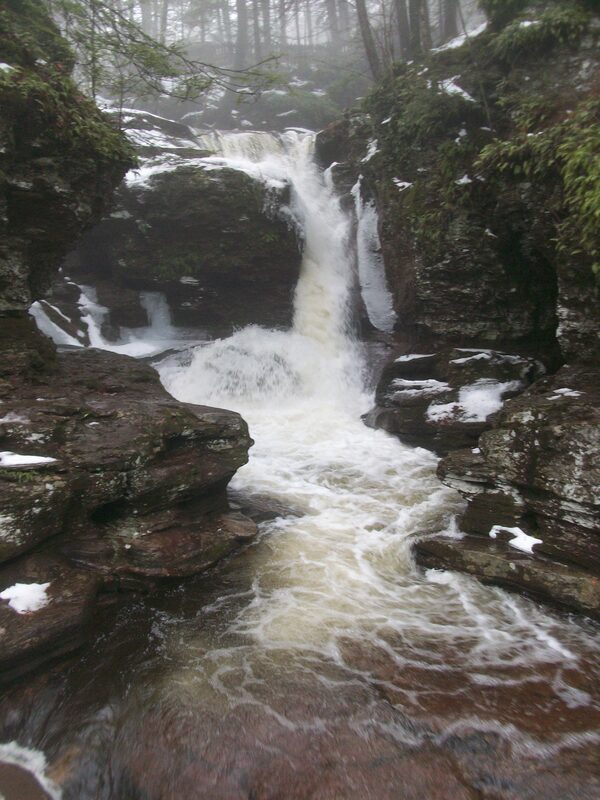 Yesterday, I decided to go for a quick hike and I found myself in Ricketts Glen State Park. It has been years since I hiked the famous and popular Falls Trail; I now spend more time exploring the little-known areas of this large and diverse park. Regardless, the Falls Trail was closed. With snow on the ground and fading daylight, my options were limited. I was going to drive up to Lake Jean, but as I drove over Kitchen Creek along PA 118, the forest floor was shrouded with a dense layer of mist. I had to check it out. 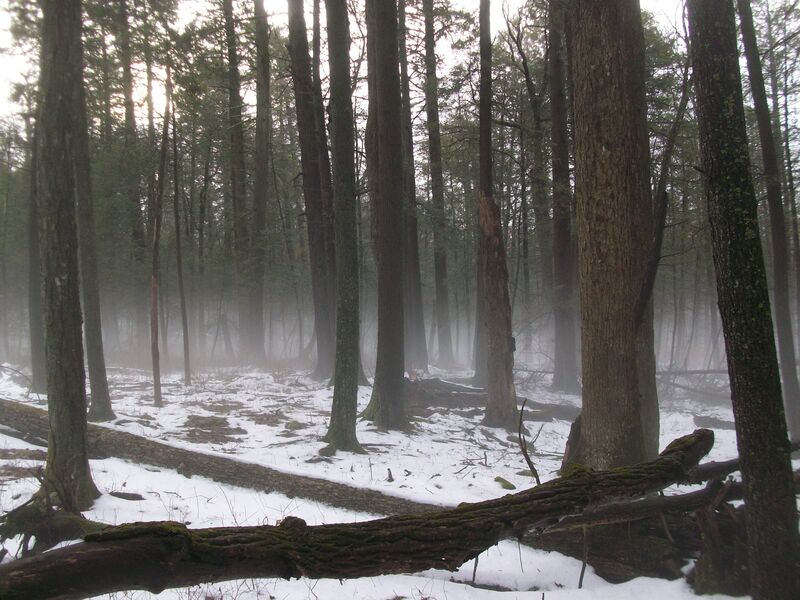 The mist was formed by the warm and humid air over the snowpack. The mist congregated along the creeks and hollows. I began my walk on the Evergreen Trail, an easy, overlooked trail that is a pleasure to hike. It is perfect for kids. The icy walk down to Adams Falls took some care. The falls were flowing great with roaring water surging through a chasm in the red bedrock. The trail took me across the creek and into the “Hemlock Temple” of the Evergreen Trail. This trail features an impressive old-growth forest that is serene and beautiful. 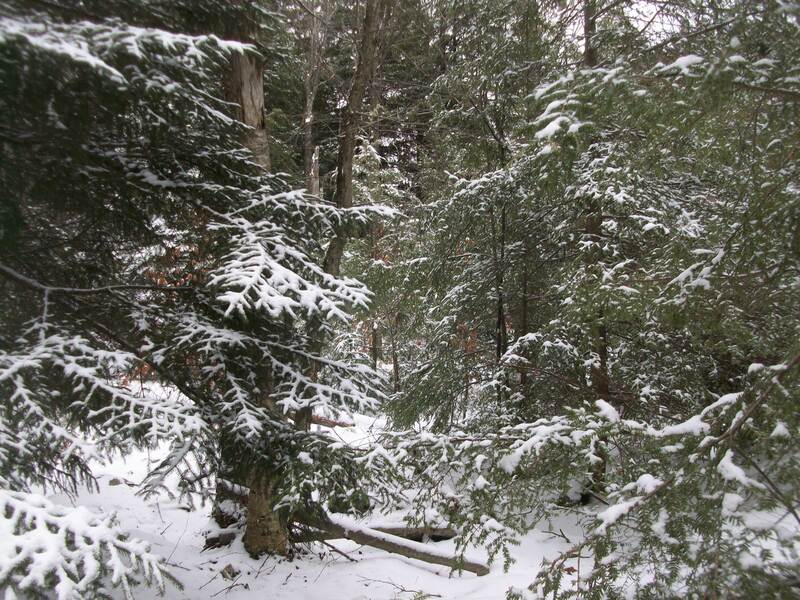 However, the hemlocks are dying from an invasive species, the wooly adelgid. The largest and healthiest trees are now the white pine and tulip poplar. The veil of mist that was draped across the floor of this ancient forest was both eerie and beautiful. Massive white pine trees soared into the air, towering over 120 feet. The dead standing trees were stripped of their bark, leaving a silver sheen over the damp wood. As the sun tried to fight the clouds, a translucent light spread through the forest, illuminating the mist. The trail passed a huge tulip poplar, the park is near the northern limit of this tree’s range. These trees can grow to incredible proportions, and they create a sap that is sweeter than maple syrup. Once I hiked out of the mist, the temperature became much warmer and my glasses briefly fogged up. I hiked a little further, gazing at the large trees, and returned to my car. It is hard to believe some of these trees are older than the United States. It seems the greatest temples are made by nature. Sometimes it is the feel of a place that makes it so special. It may be easy to appreciate waterfalls or vistas, but to explore a place few others have been and feel the cycles of life that it harbors is just as rewarding. We returned to SGL 57, and this time the goal was an area north of Stony Brook where a prong of the plateau juts out, west of Flat Top. Since it doesn’t have a name, I’ll just call it Middle Top for the sake of reference. I first hiked this area almost two years ago when we traversed the eastern rim of Middle Top. There were no stand-out views, but even then I know it was special. The deep forests, pristine springs, carpets of moss, and countless caves and crevices along the rim of rock outcrops created a realm where nature seemed to take precedence over man. It felt primeval, silent. On this hike we walked up along Stony Brook through a few inches of snow. We finally reached near the top and left the trail to begin the bushwhack. We were soon greeted by deep spruce and hemlock forests. While spruce is somewhat common up here, it was a pleasure to see so much hemlock. We spied what seemed to be an opening, but it was a bog. We continued south into a mysterious hemlock grove. The wildlife was amazing. We saw bear tracks and countless coyote tracks; in places they trampled the snow down with all their tracks. We felt as if we were being watched. But the snow revealed all that lived here. Ahead were some ledges with deep cracks that we scaled to reach a bald surrounded by spruce and hemlock. Mountain laurel guarded the edges. Everything was dusted with snow or glazed with ice. As we hiked through the ice-covered laurel, it sounded as if we were crushing glass. The bald was beautiful. It was so isolated and quiet. Pebbles and rocks dotted the surface as the deep, green forest surrounded us. It was a hidden place, undisturbed by man. We felt as if were hundreds of miles from anywhere. We hiked along the bald along groves of spruce and hemlock. Our hike soon returned us to the forest. We tried to cross a swamp, but it was impenetrable. The forests revealed another, smaller bald where we got a bite to eat. The sun began to fight through the clouds. I decided we needed to head south to find the rim of the plateau, and we were treated to another hemlock forest. A rim of ledges soon came into view, accompanied by the sound of water. I was surprised that a creek would be flowing this far up the mountain, and it was a decent sized stream. 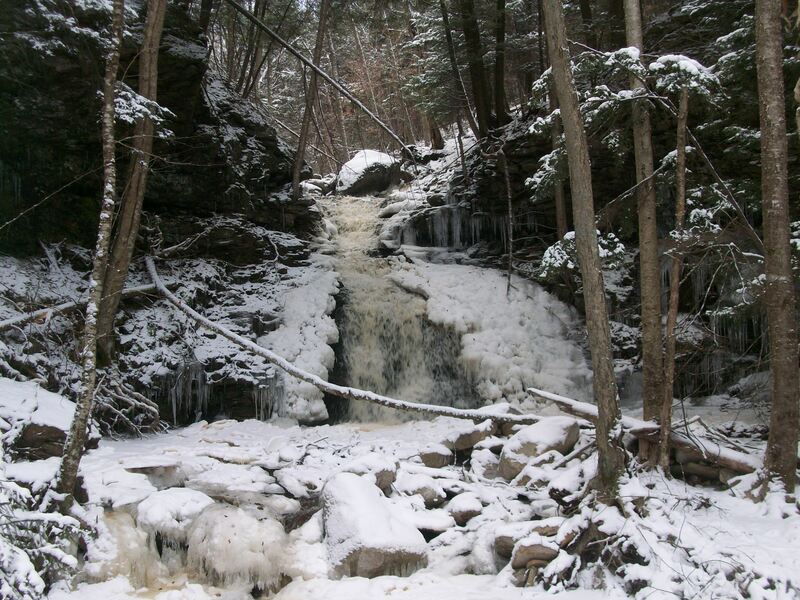 I followed the creek into a beautiful grotto of boulders and hemlocks to see a ten foot cascade dressed with icicles. The forest revealed a long ledge wall with caves and crevices. I even walked up through one of the caves. The sun finally broke through the clouds as we reached a cliff with deep crevices and a partial view through the trees. This is the point we reached on our last hike. Thick, stunted hemlock trees grew behind us. We decided to return along the stream we had discovered. This unnamed creek descended steeply with many cascades. We crossed under a forest of bare hardwoods, with some very large trees. The creek became steeper as we inched our way down the steep slope. There were some larger falls that were over ten feet high. We soon retraced our steps at Stony Brook. A walk back to the car followed. Unlike most of our hikes, we weren’t walking back in the dark. As we drove back home, the primeval forests of Middle Top were high above us, cast in the shadows of a winter afternoon. Despite only visiting Somer Brook Falls for the first time last week, I made my return a few days ago. This time, I brought some company; Leigh Ann, Melissa, and Florian joined me on this hike. I was excited to see the falls after some recent rains and cool weather. Despite the snow and ice covered road, my Subaru had no problem as we climbed up the mountain. We reached the top and began our hike under deep, aromatic spruce forests. It was a different world, from the bare forests and fields in the valleys, to the colder, snow covered, and green spruce forests on top of the mountain. We were surrounded by green. Our first stop was to the stone cabin, and then we hiked through the woods and reached the top of the falls. 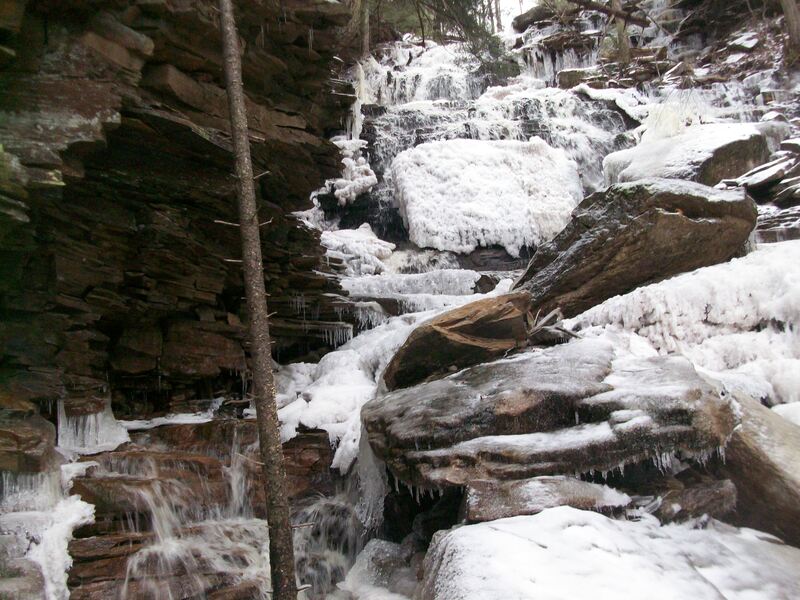 The falls were encased in columns of ice, sheaths of it covered rocks and branches over the water. We made our way down to the base of the falls and everyone was impressed by the scenery. The water was bit higher on this hike as ice surrounded the cascading water. If the falls ever froze over completely it would be an amazing sight, rivaling even Kasson Falls, a few miles to the north. We climbed back up and got a bite to eat above the roar of the falls. We could see the distant mountains through the trees. On the hike out, the creek was our guide through the verdant forest of moss and spruce. The creek meandered quietly. We returned to the car for the drive down the mountain.